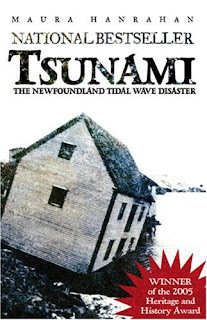 Until I saw the book, Tsunami: The Newfoundland Tidal Wave Disaster, I had never heard of this disaster. Weeks after the stock market crash that brought in the Great Depression, an earthquake occurred deep in the ocean, 250 miles south of Newfoundland. The quake created a huge tsunami 27 metres high in some places that came roaring into the Burin Peninsula of Newfoundland destroying whole communities and taking lives. Twenty-seven dead. Staggering property losses. Triggered by an offshore earthquake on the Grand Banks, a tsunami unleashed its fury on the coastline of the Burin Peninsula of Newfoundland, killing twenty-seven people and destroying homes and fishing premises in fifty outports. Here is the dramatic, incredible story of the South Coast Disaster of 1929, the superhuman efforts of Nurse Dorothy Cherry to save the sick and dying, and Magistrate Malcolm Hollett’s tireless campaign to rebuild shattered lives and devastated communities. Maura Hanrahan does a great job in telling the story. She recreates some of the conversations and activities that were going on before the earthquake shook the island and the three waves came crashing in, from many interviews with the survivors. Some of the men had been in the South Pacific during the first world war and had themselves experienced tsunamis, and tried to warn others in their villages, when they saw the water in their harbour sucked out. Some listened to their warnings and took to high ground. Others chose to ignore them as foolishness. Still others never heard them. It is sad, horrible tragedy but as in all tragedies heroes do step forward such as Dorothy Cherry, a nurse who took to her horse traveling to community after community to tend to the sick and injured. Townspeople had to stand together as the cable, Burin's only link to the rest of the world, was cut by the earthquake. For three days the world did not know of the disaster until the SS Portia came by on a scheduled stop and radioed St. John's for help. Although not part of Canada at the time, it's great to see that Canada was, by far, the largest contributor to the relief effort. This book deservedly was shortlisted for the 2005 Newfoundland and Labrador Book Awards and won the 2005 Newfoundland and Labrador Historic Sites Heritage and History Award. It is a piece of history, a disaster that the rest of the country should know about. This book is an excellent place to start.